Electrochromic windows, so-called ‘smart windows’, share a well-known problem with rechargeable batteries – their limited lifespan. Researchers at Uppsala University have now worked out an entirely new way to rejuvenate smart windows which have started to show signs of age. The study, published in the distinguished science journal Nature Materials, may open the way to other areas of application. Smart windows make it possible to control how much visible light and solar energy enter a building. This energy often leads to too high indoor temperatures in commercial buildings the world over, even in Sweden, so there is a need for air conditioning. Smart windows can drastically reduce energy consumption for air conditioning, and they can also help create a more pleasant indoor environment by reducing the amount of dazzling light coming through them. 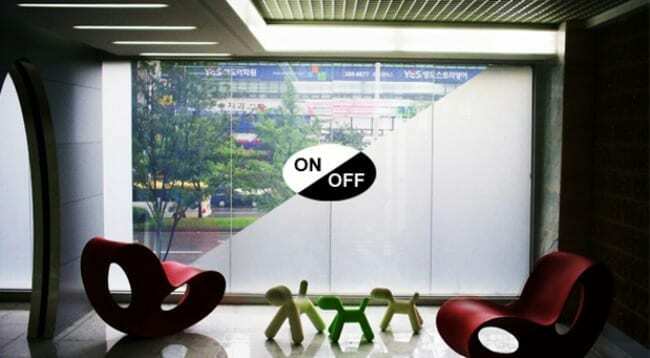 The electrochromic smart windows are controlled electrically. This kind of window is the result of research carried out at Uppsala University. Commercial production has recently been started by the company ChromoGenics AB. The electrochromic smart window is made up of a series of thin layers on top of each other. The most important of these are two layers of tungsten oxide and nickel oxide, both about a third of a micrometer thick. They are separated by an electrolyte layer. The window’s opacity to visible light and solar energy varies when an electrical current flows between the oxide layers. “The principle is the same as for an electric battery. Here the tungsten-oxide is the cathode and the nickel-oxide the anode. Opacity depends on how much the ‘battery’ is charged,” says Rui-Tao Wen, a doctoral student who carried out the study as part of his thesis. The lifespan of both electric batteries and electrochromic smart windows is a well-known problem. They need to work after being charged and discharged many times if they are to be really profitable. In the study, the researchers show that an electrochromic tungsten oxide layer which has been charged and discharged many times and has started to lose its capacity can be restored to its former high capacity. This is achieved by running a weak electric current through it while it is in light mode. This takes about an hour. In this way, the electric charge which has ‘fastened’ in the material is removed and the tungsten oxide layer is like new again. “This is a new way to rejuvenate smart windows so that they last much longer. And the same principle might perhaps be used for electric batteries,” says Claes-Göran Granqvist, senior professor at the Ångström Laboratory, Uppsala University and one of the authors of the study. April 16, 2019 - What Happened to Notre-Dame's Precious Art and Artifacts? Smithsonian.comOfficials say the 'main works of art' were saved. But others have been lost or seriously damaged. April 14, 2019 - Smart Windows Materials Market (2019-2024): Market Forecast by Technology, Components, Type and Competitive Landscape Top 360 NewsThe Smart Windows Materials Market report intends to provide cutting-edge market intelligence and help decision makers take sound investment evaluation.